I climbed the mountain of single motherhood to find a most unexpected prince at the peak. God offered me His very best when I least deserved it. Within three years of marriage, Scott and I added two more daughters to the "sorority" bringing the total to four. It was easy to settle into the rhythm of His mercy and grace. By the time our daughters were 2, 3, 10 and 13 we had built a dream home, family and life. One phone call shattered the calm, easy timbre of my days. "You're right, dear, I have cancer." The words pressed in on my heart like a 100 degree, 100% humidity day. They suffocated and terrified in a single stroke. I barely felt I'd survived life as a single mother to two, how could I possibly face it with four? My small offering of faith was eye to eye with my biggest fear. Would I trust God and walk in faith or wilt under the weight of worry? Through prayer and an extra helping of God's mercy, my husband's health was completely restored over a twelve month period. Have you trusted God...? Evangelists often phrase an invitation to initiate a relationship with God like this. They imply trust is a one time event. My inner wimp wants to tell you trusting God was a one-time event. We faced cancer. Trust prevailed. Story ended. But life isn't like that is it? I bet you, like me, have a trust issue tapping your shoulder this very morning. Whether your dollars are too small or your relationship tension too big, you likely awoke to trouble. But what if our trust issue is actually a trust opportunity? What if we need to give ourselves the same advice we so flippantly offer others? Go to Jesus. When life makes us stumble, let's fall into His arms. 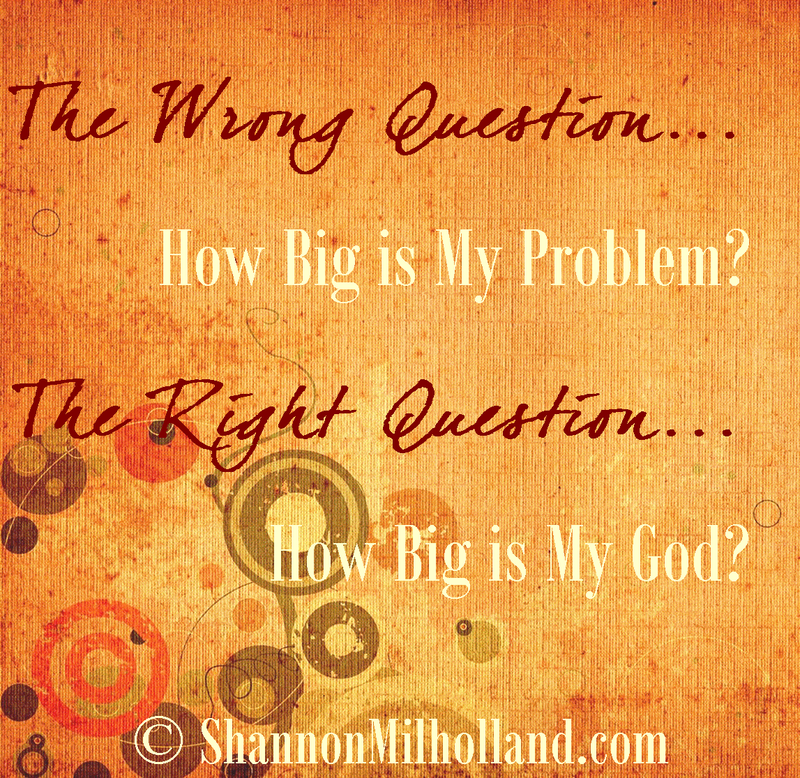 Let's stop asking how big is our problem and start asking how big is our God. What looms large in view today? 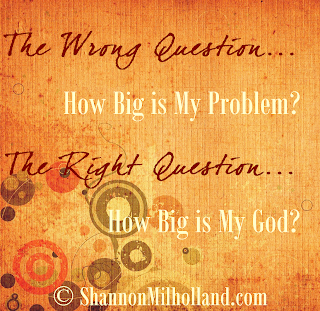 Do we dare to shift our perspective from the size of our problem to the vastness of our God? Hi Shannon, thank you for this article. While crossing the street on my way to school at sixteen years old, I was hit by a car. I became paralyzed. Trust and faith is what got me to walking at thirty-four. I'm now learning how to walk with one cane. Extremely blessed! Wow, Zina, what an amazing story of struggle and triumph. I'm sure many of those days have been difficult but God never abandoned you even on the darkest day. Beautiful! How wonderful that your husband is cancer-free. You hear stories of extreme faith every day, and I always hope I could do it, but you know...sometimes I really wonder (and then THAT makes me feel bad). Working on it...praying for the wisdom to trust. Wow, Rosey - "wisdom to trust" - That's huge! Hi Shannon. Thanks for your encouragement here in the Garden. Hearing stories of healing and miracles lately, like this one, has really been blessing my socks off and encouraging my own faith journey. So thankful. God shows His greatness again and again. It's no wonder He instructs us to tell our children of His greatness. 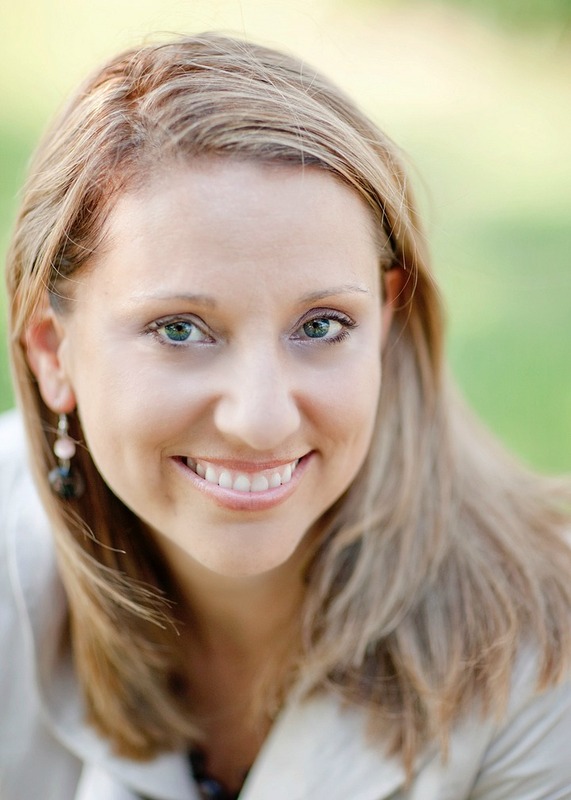 Shannon, you won't believe how timely this post was for me. Right after you posted I received news that one of my aunts had suffered a terrible freakish accident. She also suffered cardiac arrest. This morning, she passed away and it hit me really hard. Thanks for your transparency and encouragement to trust God with every challenge, trial and discouragement. He really is much bigger than our problems. Oh Carla, praying for you and your family as you let your aunt go. Praying for God's peace, comfort and strength - that He would sustain you on these long, hard days. Ah sweet Shannon, you have such a lovely way of wording important issues. I just recently made a list of things I want to completely conquer. It all boils down to faith and trust in my Savior. HUGS and a happy Wednesday!